Preheat the oven to 300 degrees. In a large bowl, combine all the dry ingredients. Stir to mix well. In a small bowl, combine all the wet ingredients. Stir to mix well. Pour the wet ingredients into the dry ingredients and mix well. Spread the mixture evenly onto 2 cookie sheets. Bake for 35-40 minutes, or until evenly golden brown. Rotate the pans in the oven and stir the granola every 10 minutes while it bakes. The granola may still feel slightly soft when it comes out of the oven, but it will crisp up while it cools. 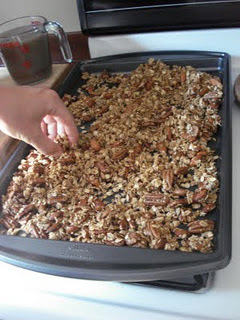 Once it is cooled, scoop the granola into a large ziplock bag or another airtight container. Store the granola in the refrigerator indefinitely.